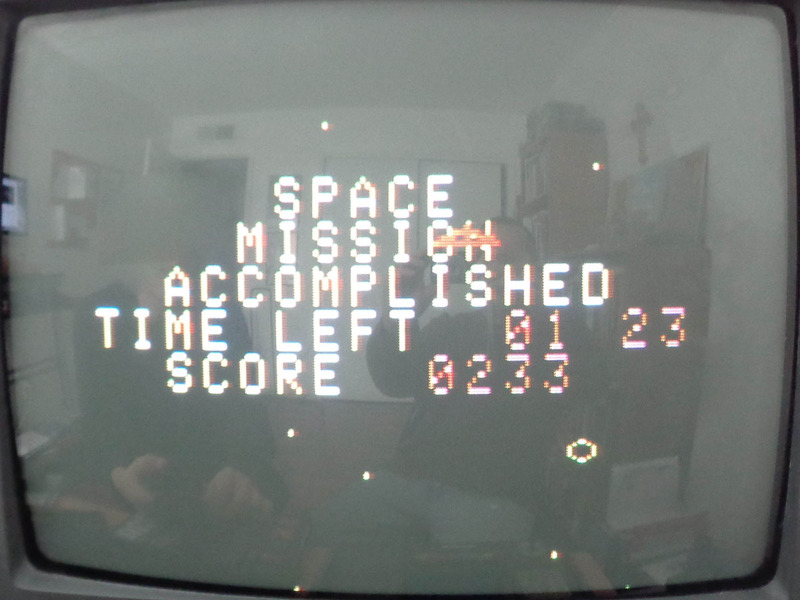 Season 2, Round 3 of the Arcadia 2001/MPT-03 High Score Club will last about two weeks. This round ends on Sunday, February 18, 2017 at 10pm MST (aka Monday, 2am GMT). 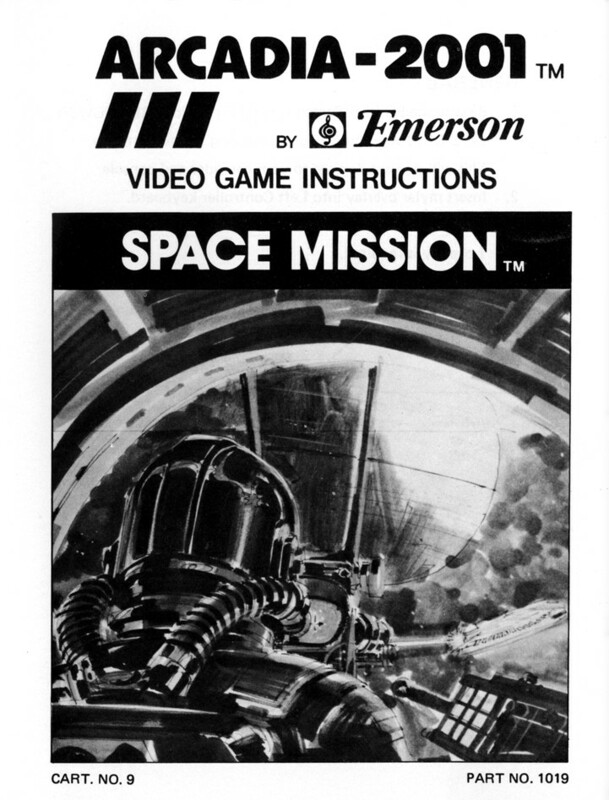 The game being played this round is Space Mission, a game released in 1982 for the Emerson Arcadia 2001. The game is very simple, but the manual makes it seem overly complicated. 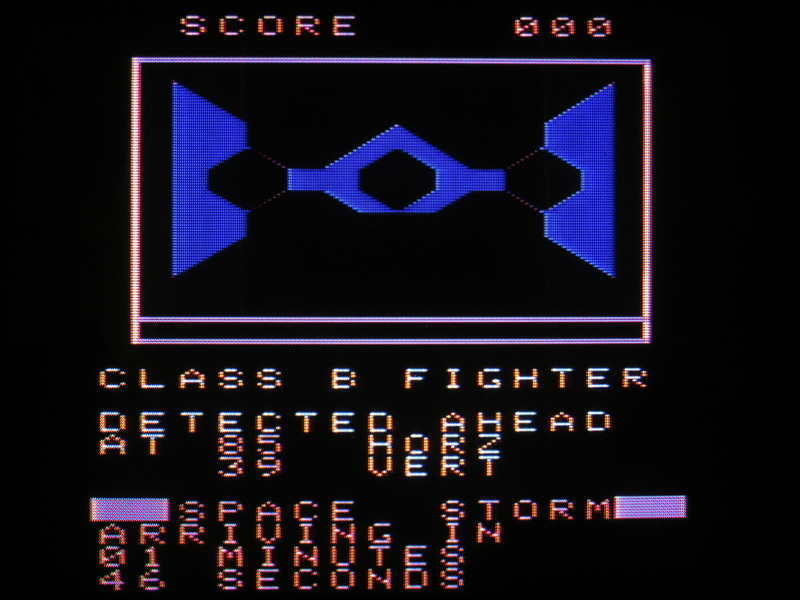 The object of this game is to collect parts of a four-piece spaceship and put them together in the correct order. Space Mission is extremely simple, but there are many frills (such as a 3D-tube launch of your drone ship) that do not affect how the game is played. 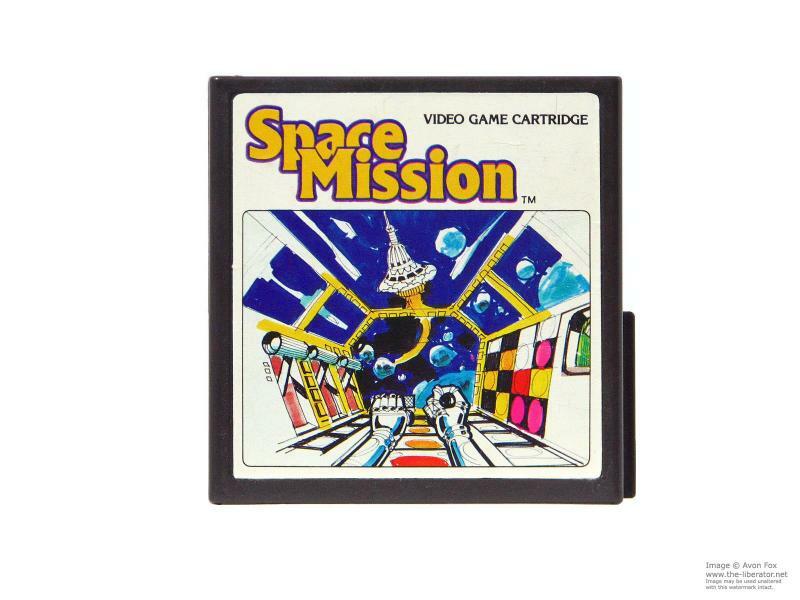 "The player's mission in Space Mission is to rebuild a four-piece space station within about two minutes. This is done by launching a 'droneship,' guiding it towards each piece of the station, loading each piece onto the ship, and placing the pieces in a specified pattern. Naturally, alien spaceships will attack. 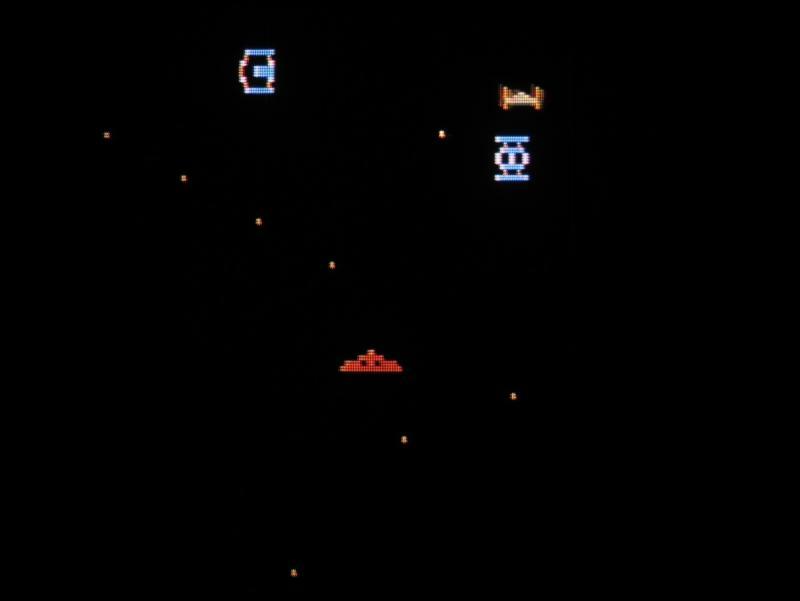 To ward off these pests, players must switch control to a 'commandship,' which can destroy the aliens with laser missiles. This is yet another classic videogame that contains spaceships that look like TIE Fighters, but the space station element does add an unusual twist to the first-person shooter genre." Here is a video with gameplay of Space Mission uploaded to YouTube by "GameAnthology" on March 9, 2013. 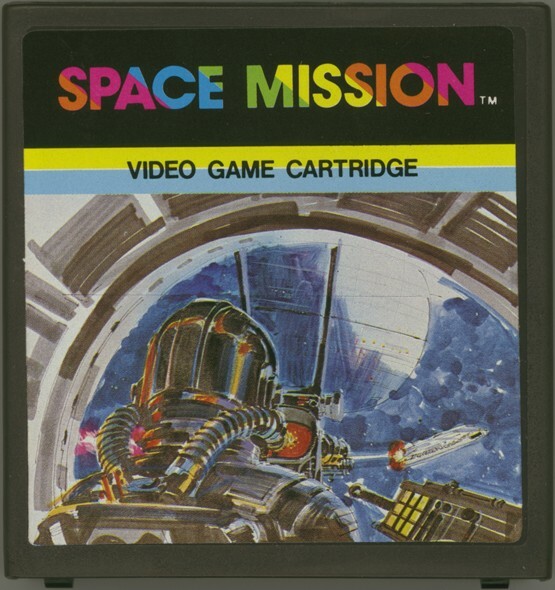 Here is some alternate cartridge artwork from two various non-U.S. releases of Space Mission. I'm really beginning to enjoy the various different artwork for the non-Emerson release of Arcadia 2001 console game. 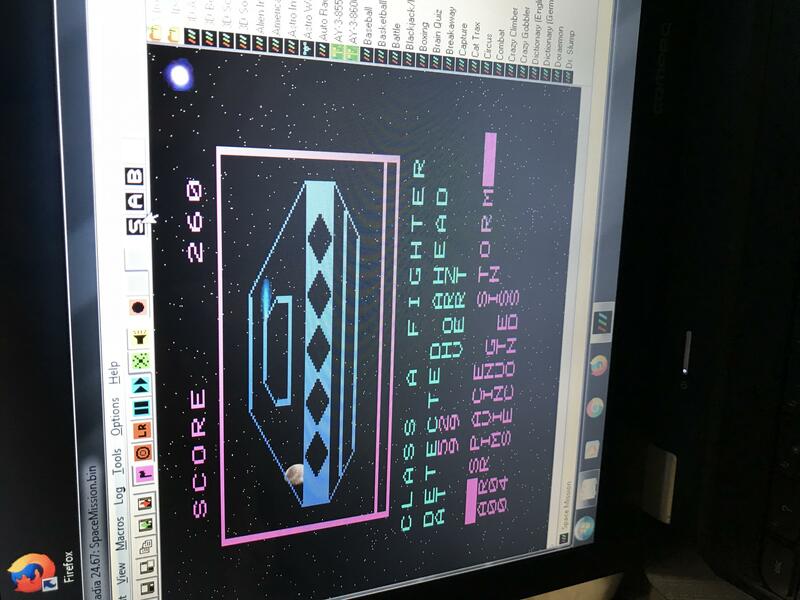 Play Space Mission on real hardware (PAL, NTSC, and any Arcadia family systems) or use the WinArcadia or MAME emulator. There are no gameplay options for this game. Just press the Start button and begin playing. Every game lasts two minutes. We're playing for the highest score with the lowest time. This may make scoring a little difficult; we'll see how this works out during the full round. I'll make adjustments to the scoring if it seems necessary. I'm using Ward Shrake's "Director's Cut" of his Arcadia 2001 section of the Digital Press Collector's Guide 7 (published in August 2002) for most of the information that is in this section. I'm including Ward's information about Space Mission on two difference systems, the Emerson Arcadia 2001, and the Sheen. Through-out the world Space Mission is also known as Mission Spaciale, Raumfahrt and Weltraum-Abenteuer. Space Mission - Emerson - 4k cart. 1982. #1019. Cartridge #9. Space Mission - Sheen - #M4. - One player game; uses left side controller. Game by "UA Limited". 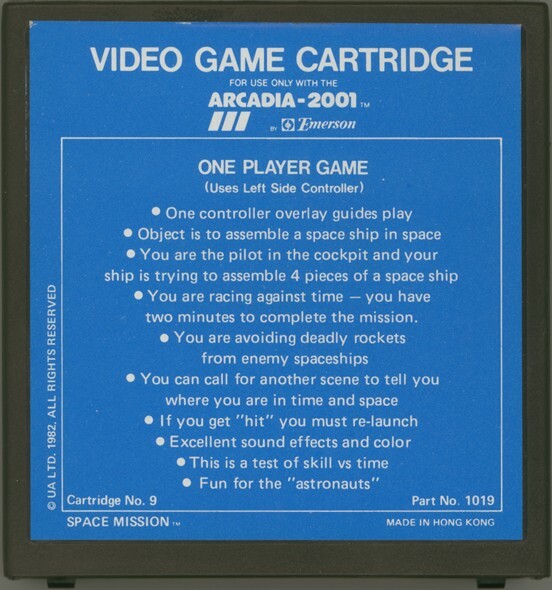 "Object is to assemble a spaceship in space," according to game instructions printed on the rear of the cartridge. Label art shows space ships from the movie "Star Wars". You appear to be looking over the shoulder of an "Imperial Pilot" inside a "TIE fighter". Looking out the round front window, you can see the "Death Star". The "TIE Pilot" is apparently firing on the "Millennium Falcon" space ship. Your mission is to build a space station in the limited 2 minutes time. The space station is divided into 4 pieces and each piece is floating in space. You have to launch a "DRONE SHIP" to "LOAD" (PICK UP) and "UNLOAD" (DROP) the pieces at the appropriate spot to build the station, while you are at the bridge of a Mother Ship. There will Alien Fighters Firing at your DRONE SHIP. Steer your DRONE SHIP to keep away from the gunfire. If the DRONE SHIP is destroyed by the gunfire, another can be launched. There is no limit to how many DRONE SHIPS can be launched. While building up your space station, you can shoot your laser gun at the Alien Fighters. However, you can shoot your laser gun only when your DRONE SHIP is unloaded. Mission will fail if you can't build the station in the limited 2 minutes time. Score will be given if mission is completed within minutes, according to the following formula. Press POWER Switch to "ON" Position, the red POWER light will be lit. 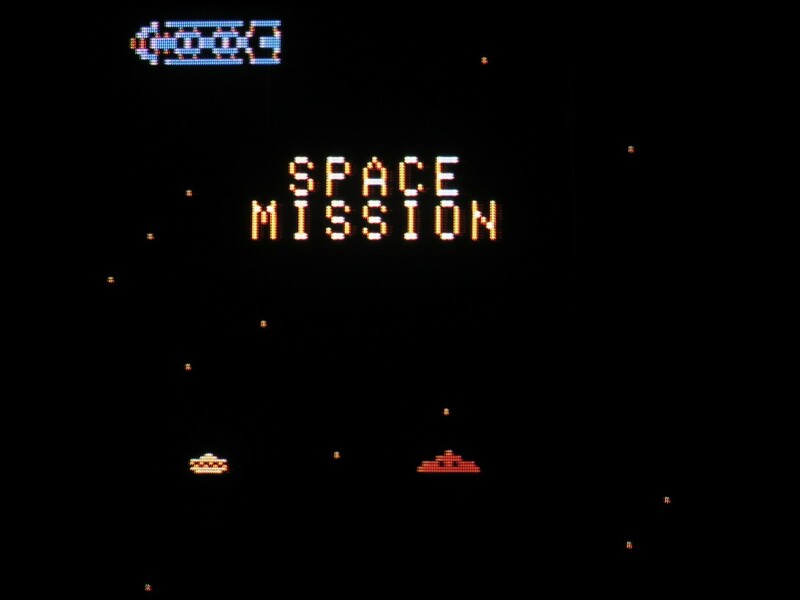 Press "RESET" button, the "SPACE MISSION" will shown in screen. 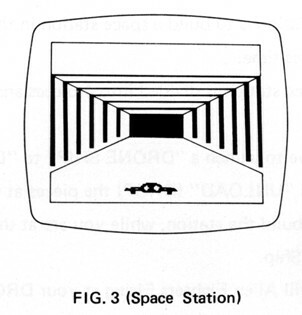 The upper Left corner shows the space station to be built (see fig. 3). Press "START" button to start the game. 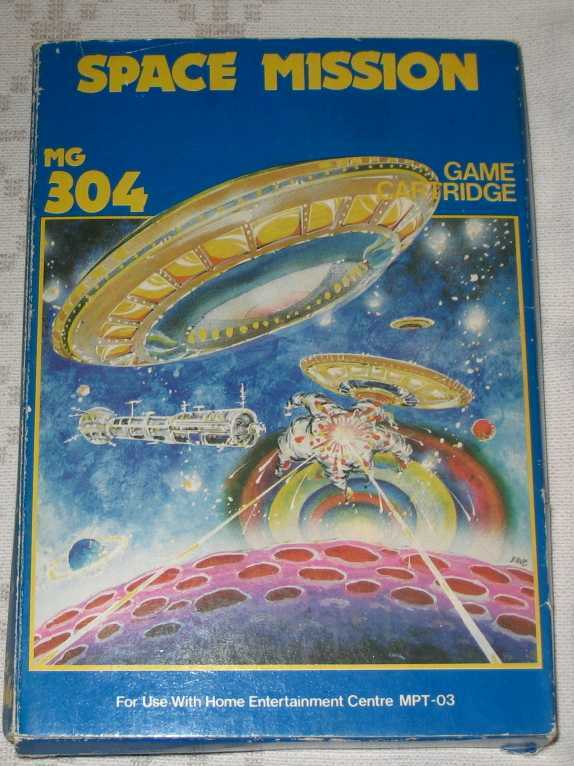 Once the game has started, you are at the bridge of the Mother Ship and have a 360 degrees view of space. Steer the Mother Ship by pressing the control disc in direction you want to fly. To fire Laser Gun - Press "FIRE" button on the overlay Laser Gun will keep firing as long as you press the "FIRE" button. Press disc to steer the Mother Ship and aim at the Alien Fighters. To launch Drone Ship - Press launch button. A close up take- off view of the Drone Ship will be shown and take off engine sound will be heard. To Control the Drone Ship - Use control disc to steer the Mother Ship. Both Drone Ship and Mother Ship move. Press "STEER" button on the overlay and use the stick control to control direction. This allows you to steer the Drone Ship only. The Mother Ship will stop moving. To pick (LOAD) the space station pieces - steer the Drone Ship to the piece you want to pick up, then press "LOAD" button. When the piece is loaded it will change color. Carry the piece to the desired place and drop it by pressing "UNLOAD" button. Try to bring it to connect to the piece you want to join. If "UNLOAD" button does not release it then try to match it closer to the other piece. Continue this action until the 4 pieces have been put together in correct order (according to original view, see fig. III). If you complete the assembly of the space station within 2 minutes time. A "MISSION ACCOMPLISHED" will appear and your score will be revealed. Congratulations! If you fail to complete the assembly in the two minutes time, try again. Good Luck and Happy Space Mission. NOTE: This is the way the assembled Space Station should look after you have successfully put all the pieces together. Space Mission has no gameplay options. Just start collecting the parts of the ship and put them together in the correct order as quickly as you can. We are playing for the highest score with the fastest time. 10 points are awarded for first place, 9 for second, 8 for third, etc. Space Mission - Video Review - (2 Points) - I didn't find any reviews of this game. Maybe because the game is so short? I'd really like to see some quality video that talks about the gameplay. 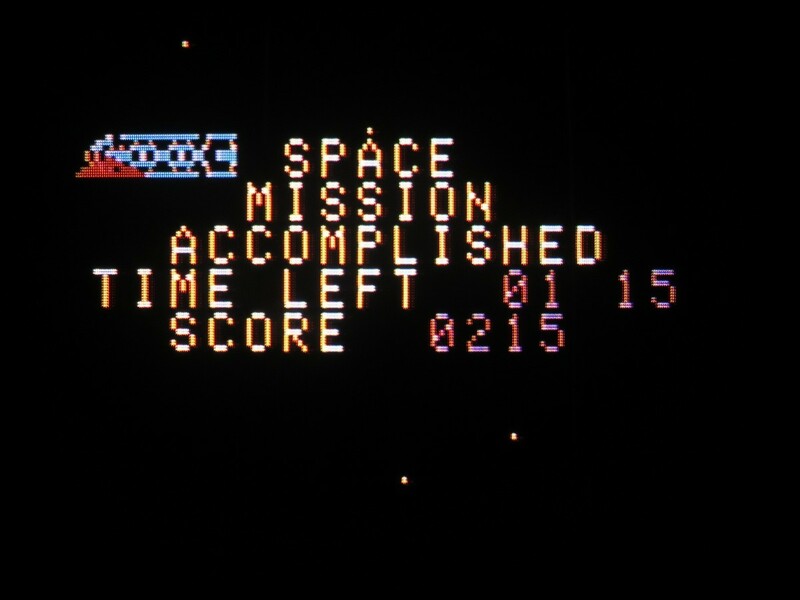 Because of the time it takes to make a "proper" video review, anyone who reviews Space Mission will earn two points. Space Mission - Documenting Bugs - (1 Point) - As we've been discovering for ourselves, Arcadia games can be flaky. If anyone finds any problems, and documents them, then they will earn one bonus point. Just in case there are dozens of bugs, you can only earn one bonus point no matter how matter bugs are found. Space Mission - Backstory - (1 Point) - Space Mission doesn't provide a backstory. I guess one isn't needed for this game, but it might be fun to write one anyway. 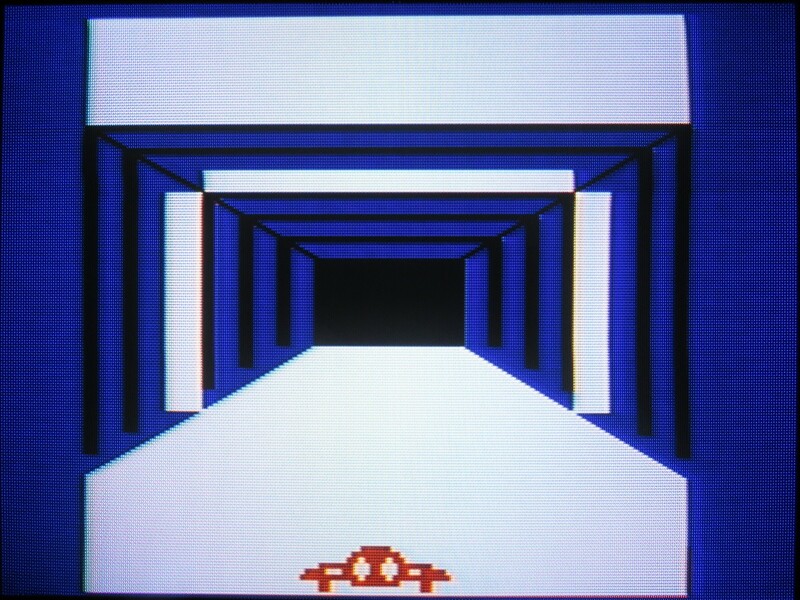 Write a background that may have been included with the game in 1982 and you'll get a bonus point. 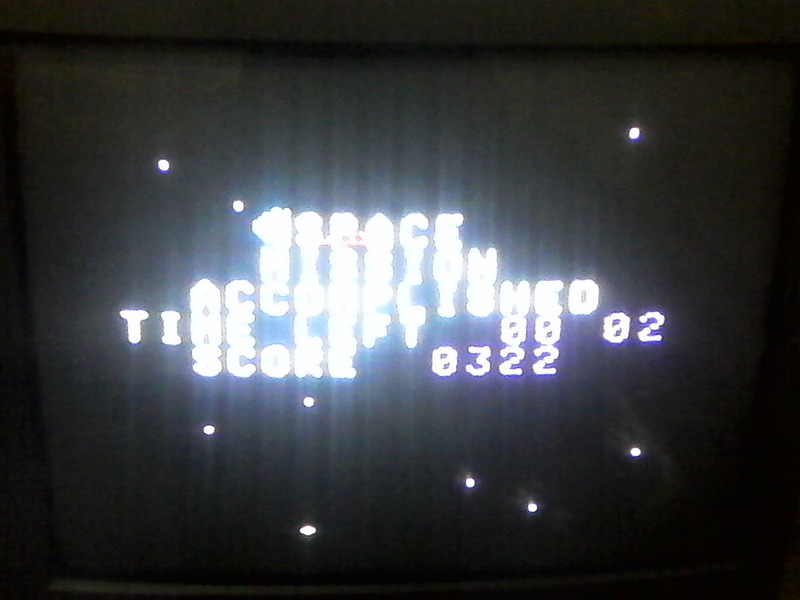 What is it with the Arcadia 2001 and timed games? Were these sorts of games easier to create? I completed a full game of Space Mission today for the first time. There isn't much to this one. I wouldn't say that this game is bad-- it just seems like a missed opportunity because it's far too short. There could have been so much more to this game if a little more time had been spent on it. But, like nearly all other games on this console I've played so far, time spent on gameplay was not a "luxury" granted to Arcadia 2001 games. It's time to start playing Space Mission. This game is very short-- you'll complete your first game nearly before you start playing it. I'm curious if playing this game against other people will make it feel a little more competitive and keep me coming back for just one more game to shave off a second or two or maybe to score a few more points. If you've not played in a high score club round before now, then now's the time to join in! Have a fun third round, everyone! I have no idea if that is a good score or not. I didn't shoot any of the baddies, I only assembled the ship. 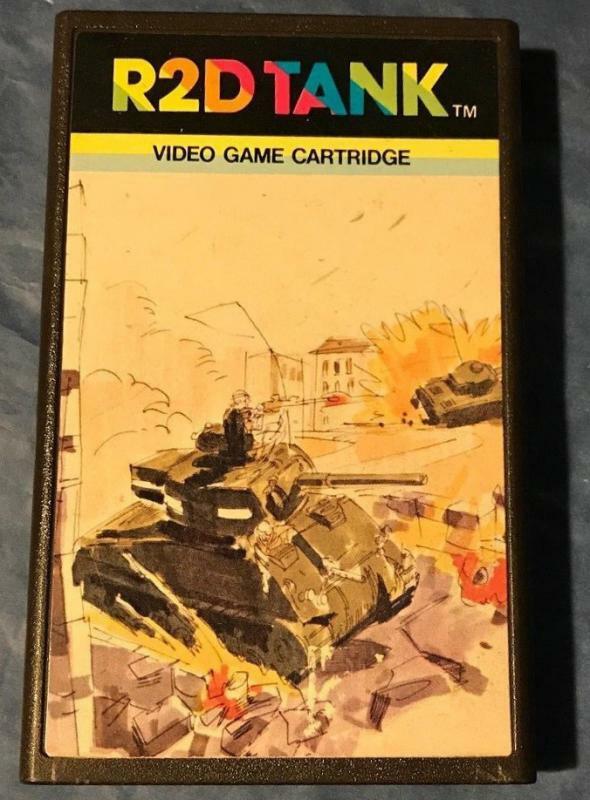 Worth noting that this game is one of the tougher ones to find a good complete copy of, which is remarkable given that it is the game featured right on the front of the system box. Edited by Blazing Lazers, Tue Feb 6, 2018 1:16 AM. Thanks for reading about the Arcadia here. One of the fun parts of this HSC is finding background material on these niche games. 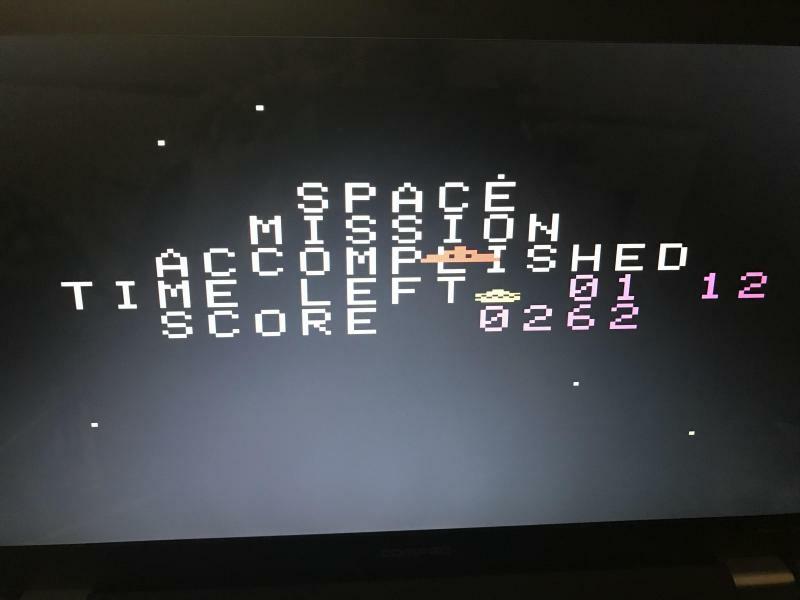 There isn't much meat on the bones of Space Mission, but it's a neat game anyway. The fact that the Arcadia 2001 game system has been released in so many countries makes it worth investigating. If you've got an Arcadia already, then hook that baby up! 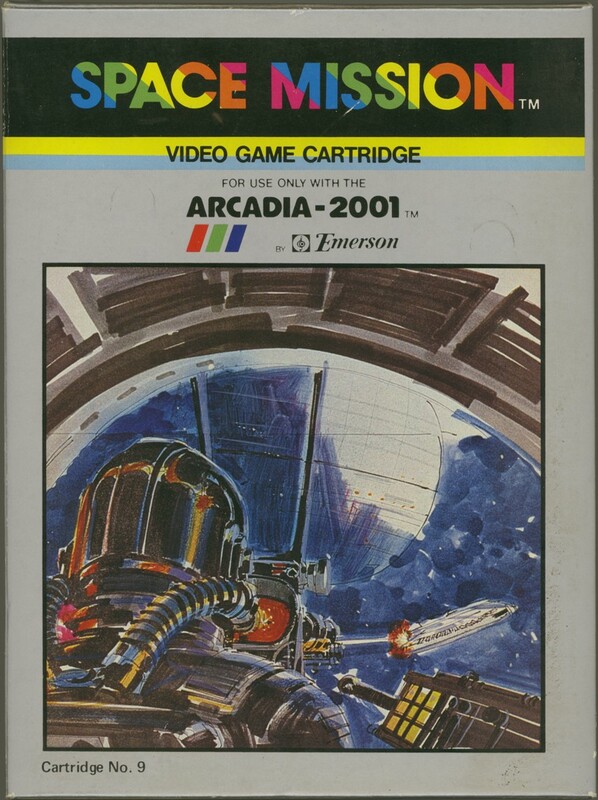 I only have a few Arcadia games, but a complete Space Mission does happen to be one of them. 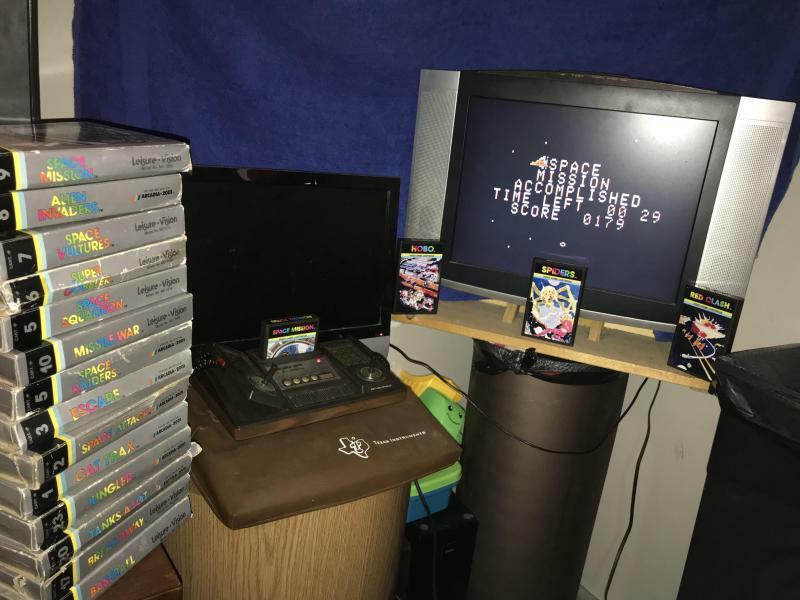 Stocking up on Arcadia games, eh? That's cool. Don't forget that the Arcadia emulator (WinArcadia) works good and it will allow you to play any games that you don't own. I always try playing each game under emulation just so that I can use an alternate controller. Unfortunately Id have to dig out another of my PCs as the emulator wont work on my main use PC which is a laptop running Linux. My Arcadia bit the dust! no video signal anymore. Going to have to open it up and see what I can find. Choose Tools > Graphics > Enhanced Skies? Make sure that "Enhanced skies" is not checked and you'll be seeing the game as it was originally intended. 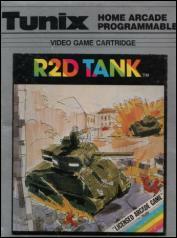 R2D Tank is a 1981 arcade game released by Venture Line, Inc. 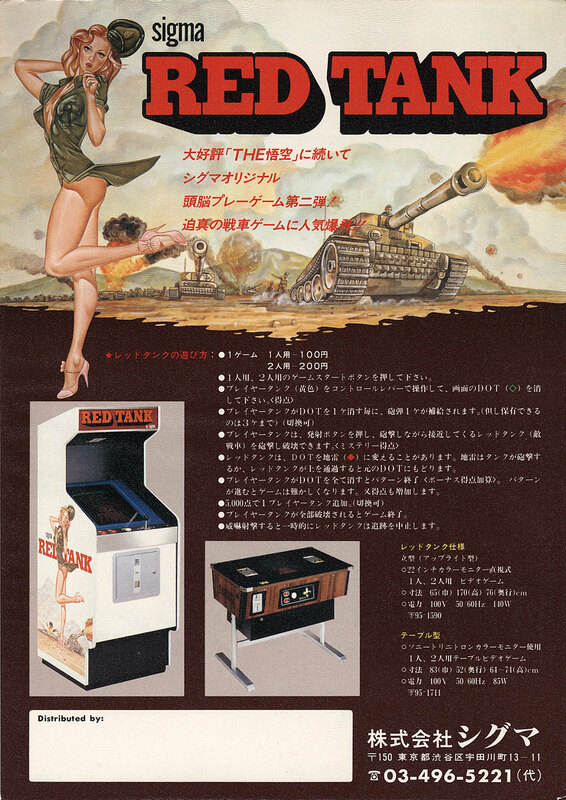 This is a release of Sigma Enterprise's Japanese game Red Tank. Like a few other titles, the Emerson Arcadia is the only console that got a home port of this game. It's a 4K ROM cartridge. 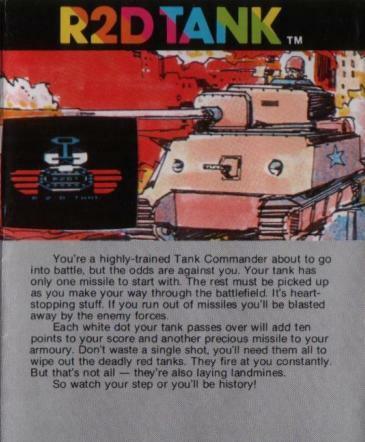 R2D Tank wasn't released in America, but according to Ward Shrake's Arcadia section of the Digital Press Collector's Guide, it has confirmed releases from Bandai, Leisure-Dynamics, Schmid, and Tunix. It may also have been released by GiG Electronics. I was surprised to see that the Bandia version of the game has the same artwork at the other versions. I presumed that since the four Japanese-only released games have much better artwork, that Bandai re-did the artwork for their other releases. Given the history of the Arcadia, I shouldn't be surprised that this isn't the case! That flyer sure is sweet! This post sure has gotten off the subject of Space Mission, hasn't it? Hmm... maybe I should mix-up the high score club a little bit. The original idea was to first play the 22 games that were released by Emerson in the United States, but we're missing out on many games, including many of the best ones. Soon we'll be playing most of the sports titles one after the other, which will be a drag. Perhaps in the next round we'll play R2D Tank. Any thoughts on this idea? I did massage the above image a little bit because a refection of Christopher's face was plainly visible in this screenshot. It is much-less noticeable now. 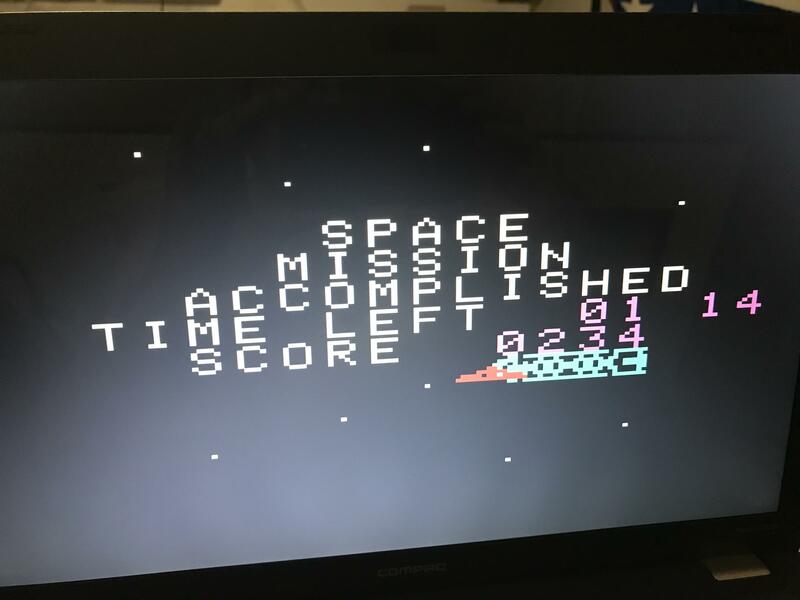 I didn't manage to destroy any enemy ships in this very short game. For the maximum score, I guess the best way to play will be to get some combination of a short game while also destroying some enemy ships. 1) The fastest time is worth up to five points. 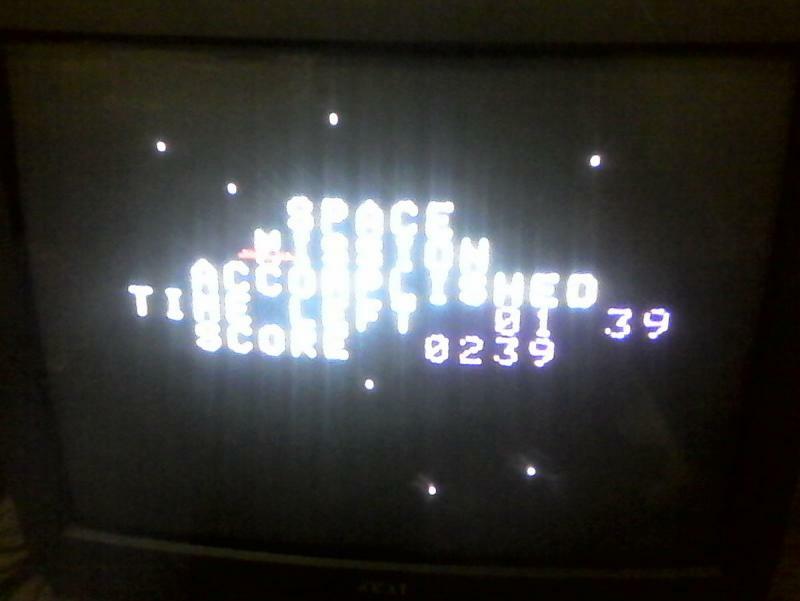 2) The highest score is worth up to five points. 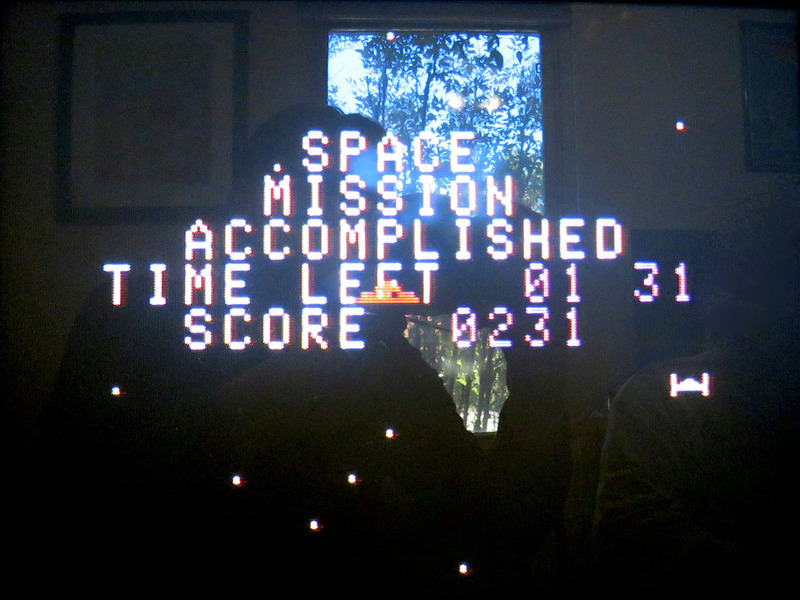 3) Only completed games count for the high score club's maximum point score. If the ship is not assembled, then 1 point each will be subtracted from the score total. Meaning even the top score and time would only be worth nine total points. 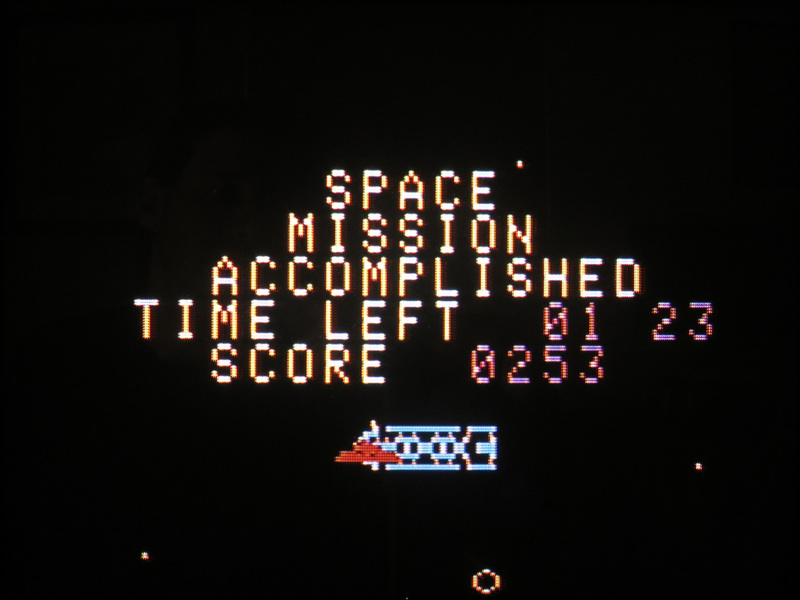 The reason that only completed games count for maximum points in score is that otherwise you can disregard assembling the ship altogether and just shoot aliens, which may allow an unrealistic score. I don't think that there isn't much room here for improvement and still being able to finish the game. 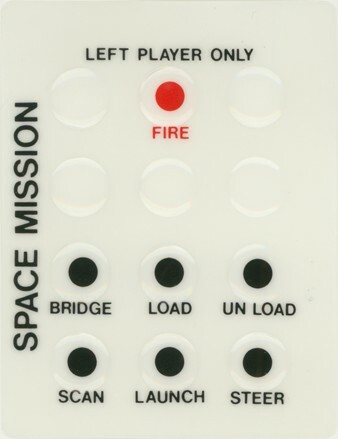 When you enter the Scan mode from the keypad in Space Mission you get some additional information. None of it is useful to the player, but it does add some atmosphere to the game. There are two enemy ships in the game. The Scan screen also acts as a game pause, as no game time passes while your on this screen. Do the horizontal and vertical positions given as information under "Detected Ahead" have any meaning in this game? Or, are they there just for atmosphere? I wonder if the programmer of this game had more in mind when it was being created? Earth is about to be hit by a space storm, it will wipe out the entire human race unless you can manage to assemble the deep space colonization vessel. Unfortunately there is a alien presence that does not want humanity to survive. Can you complete this Space Mission or are you just another wanna-be astronaut? As for bugs, there is the already-known bug that most of the non-sprite contents of the screen (stars, space station pieces, etc.) flicker except when they are in the top 8 pixels or so of the screen. I'm not sure if it also happens on NTSC machines. 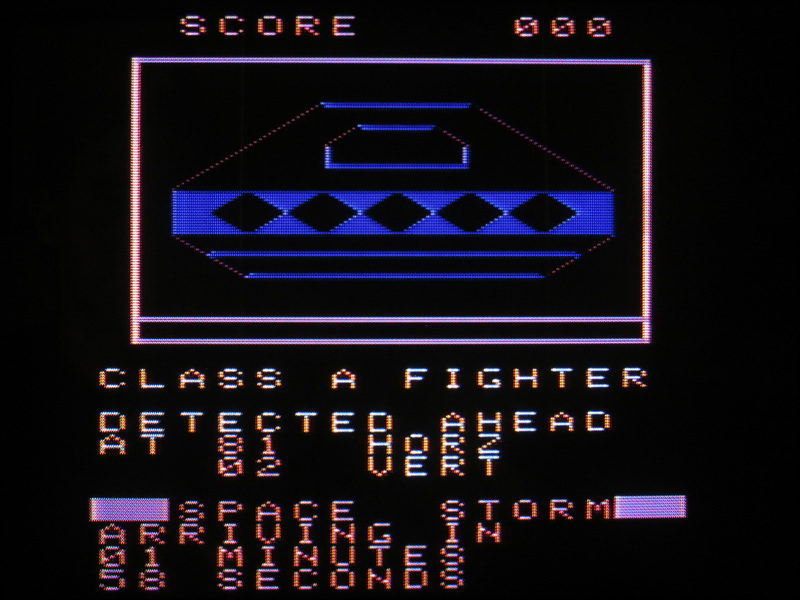 And some questionable design designs such as the constant beep on the title screen, which some might assume is a bug but is probably intentional (I haven't checked the code).